This is the earliest Kurosawa I’ve managed to acquire (on a Hong Kong DVD). The picture quality isn’t too bad but the sound is poor and the English subtitles very variable and sometimes incomprehensible. It was Kurosawa’s third film overall, made in 1944 but released only three months before the Japanese surrender – at the same time as the writer-director got married – when cinemas in Tokyo were being bombed. This sequel to Kurosawa’s first feature in 1943, that had been a hit for PCL/Toho, is generally acknowledged to be the director’s least successful film. Yoshimoto Mitsuhiro (2000) suggests that is “least satisfying artistically and perhaps most overtly propagandistic”. It’s difficult to argue with either observation. But there are several interesting points to explore. The story focuses on Sugata, a martial arts student training to be a master in a school known as ‘the Station’. The school’s master is said by some commentators to be based on Kanō Jigorō (the man associated with the transformation of traditional jujitsu or unarmed combat into the formal sport of ‘judo’). The action is set in the 1880s in Tokyo/Yokahama. Sugata (Fujita Susumu) is a strong but rather wayward young man who in the first film must learn from his master that there will always be someone physically stronger and that a successful fighter will use intelligence as well as strength. He is thus able to defeat a dangerous enemy in combat. The other main plot point is that Sugata turns down the love of a young woman in order to pursue his studies. In his autobiography, Kurosawa makes plain that he undertook making the sequel only because he was ordered to do so by Toho and that he needed the money. (He claims that he was paid around $3000 – ¥150 – for the script and direction, but that he spent much of this on location.) The fact that his heart wasn’t in it perhaps explains why some of the action sequences suffer badly in comparison with the earlier film which had been praised for the innovative techniques used on what was otherwise a conventional story. 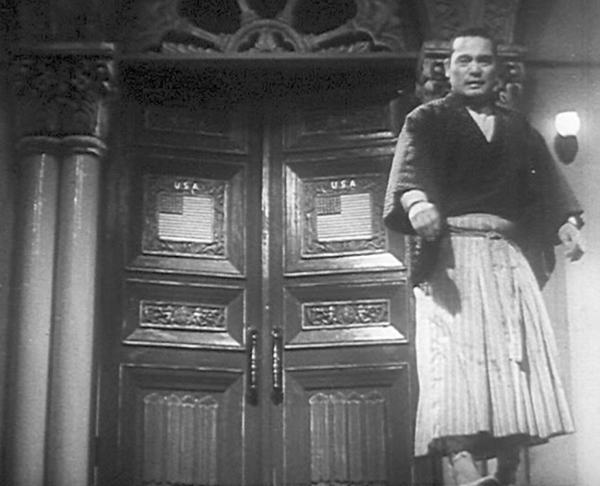 The other main problem with the film is that it looks as though much of the original script never made it into the final film – perhaps simply because the budget was so low and production generally was difficult in Japan in 1944. Certainly the attempt to carry on the relationship with the lover spurned in the first film seems perfunctory at best. Yoshimoto lists the film at 82 minutes – my DVD says 81 minutes, i.e. about 79 mins at film speed. 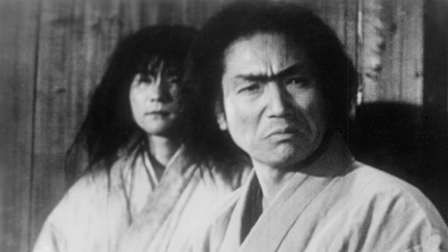 However, there are moments in the film where Kurosawa’s ability to utilise a range of filmic techniques becomes evident. Two of these are used in sequences now taken to be ‘propagandistic’. The story of the sequel repeats the original formula. Sugata is still struggling with his temper and the challenges that a martial arts would-be master must face. 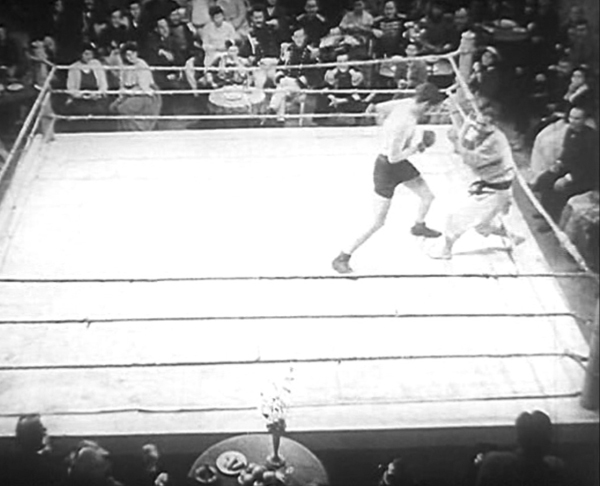 At the beginning of the film he rescues a rickshaw runner from being beaten by an American sailor and is later inveigled into watching and then participating in a contest with an American boxing champion. During these fights the baying crowd of Europeans at the American embassy is shown in a distinctively Eisensteinian montage of close-ups of European faces as a Japanese is defeated. 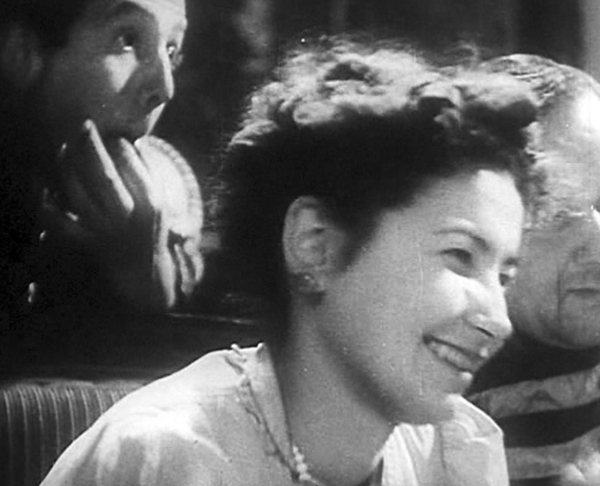 What is puzzling here is how Toho found so many Europeans as extras in 1944. An IMDB posting suggests that they were neutrals (Turkish, Swedish?). Certainly these crowd scenes are more striking than what is actually happening in the ring – which is partly the point, since the action is not ‘worthy’ of being ‘entertaining’ and Sugata tries to stop the first contest because it is derogatory towards the ‘Japanese arts’. The second example is more subtle but relates to the first. Sugata watches from the exit doors of the American embassy . . . The martial arts master lays down three rules in his school – no drinking in the dojo (the school’s fighting arena), no fighting without the master’s permission and no fighting as entertainment. Fighting the American without permission breaks two rules and Sugata in his despair breaks rule three. When the master arrives in the dojo, he doesn’t mention the discarded sake jug on the floor, but then proceeds to play a game of ‘keepy-uppy’ – manipulating the jug with his foot, tossing it and turning it in order to demonstrate moves. 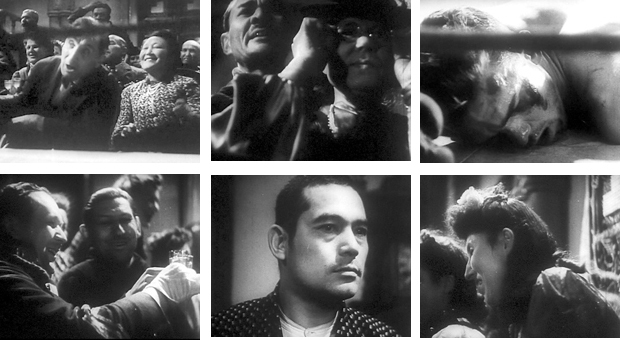 Kurosawa uses fast-cutting between the master’s dancing feet and Sugata’s desperate looks to convey a subtle message. Yoshimoto suggests that this is a propaganda message in which a warrior is given permission to fight, not for his own glory but for the good of the whole community (i.e. the school in the story, Japan in 1944). Kurosawa himself tells us in his autobiography that one of the reasons that he was keen to marry in 1945 was to experience marriage before the ‘death of 100 million’ expected to take place if Japan surrendered. The younger Higaki brothers. Genzaburo with wig and make-up is in the rear. The main theme of the film is what interested Kurosawa most – the master-apprentice relationship and the sense of the younger man learning from experience. This is picked up in the revenge plot when the original Higaki brother returns, now a frail and ill man, but one who recognises what he has learned through his fighting with Sugata. Fujita Susumu went on to appear in later Kurosawa films and became a well-known actor in Japanese Cinema. Mori Masayuki who appears in a minor role as one of the other students went on to become a major player with Kurosawa, Mizoguchi and Ichikawa. 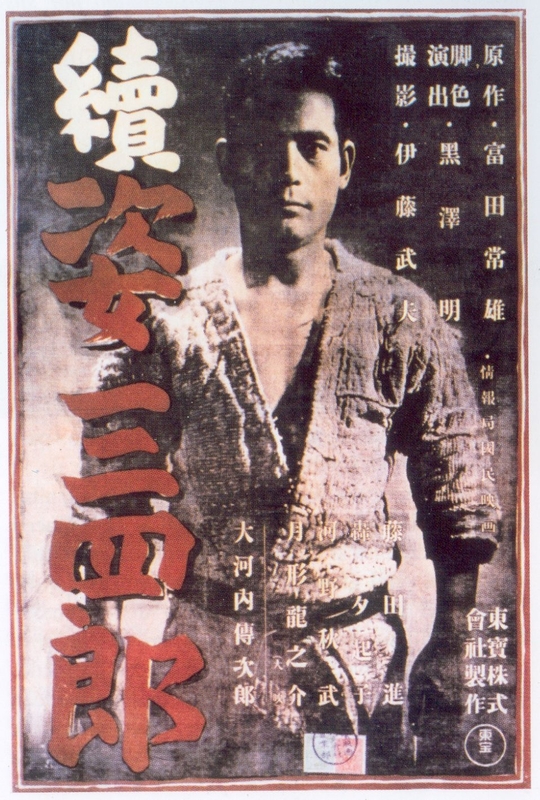 This entry was posted in Japanese Cinema and tagged Kurosawa Akira, martial arts. Bookmark the permalink. Excellent! I hope they restore this one at least, if not the sequel. So it will be a Kurosawa Marathon of sorts? Looking forward to the entries. I’ve got a fortnight before my lecture to watch at least a representative sample of Kurosawa’s films, some for the first time, so watch this space!